Rhett is all freaked out about me…me, too! I felt extra tired and weak yesterday and figured I would be better today. Ha! Three or four days ago I fell and almost every day I fall into walls. 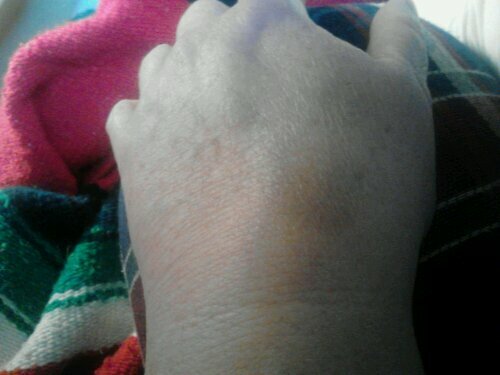 These bruises were more dramatic the day the physical therapist was here. 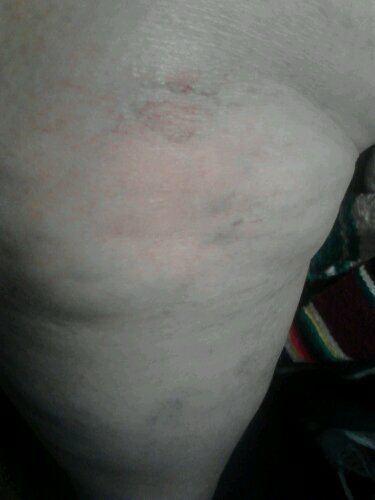 When she asked if I ever fell, I just showed her my various bruised body parts. She was sharp, she had already seen and written it down. It was kind of scary to have to quantify how often I fall all the way or part way each month. I usually try to minimize my falling. OK…yesterday I was weaker than usual. I could not move without my walker attached to me. I kept telling Rhett I was sooooo tired and sore and weak. I was moaning that I didn’t have enough strength to wash the dishes. He suggested I use the dishwasher. Since I just learned to use it on Thanksgiving day, it still feels radical and slothful and overly expensive. I washed a few things by hand, got a few tears from pain and just stuffed the dishwasher! When I sat down I kept telling Rhett I had weird breath. He went to bed and I was waaaaaay too queasy to lie down. I sat up playing with Pinterest for a couple more hours while drinking as much water as I could stand. Without going into graphic detail, let’s just say I spent two half hour sessions in the bathroom in the middle of the night. Then I realized what was going on with my weird breath. This morning I got up to go to church and was almost too weak to make it to the bathroom. I got back in bed and told Rhett I didn’t think I could drive. I had him very gently feel my hugely distended belly. Rhett was very dramatic with his OHHH, NOOOOO!!!!!! I rolled over and tried to sleep. I could smell the gross breath in my CPAP mask. My legs were going nuts with myoclonic jerks and lighting bolts of pain. No way could I go back to sleep. I rolled back over and dramatic Rhett said OHHHHH NOOOOO!!!!! YOU’RE BURNING UP!!!!! I took his hand and wiped it across my forehead dripping with sweat only to hear OHHHHHHHHHHHH NOOOOOOOOOOOO!!!!!!! Then I had to run to the bathroom and stay a long time. 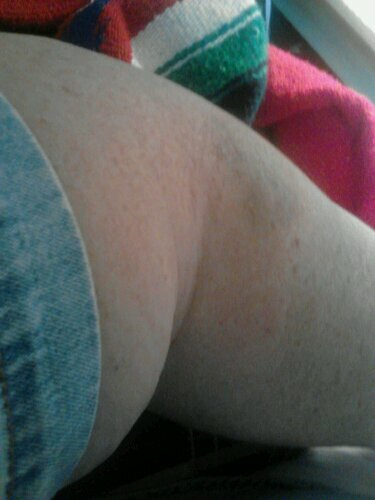 Last night after the first middle of the night bout, my bad leg swelled up. 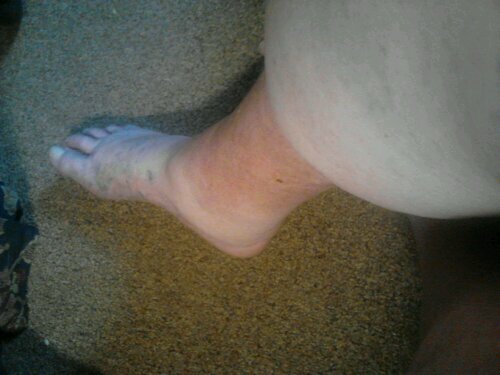 My foot and peg part of the leg have not been swollen in quite awhile. 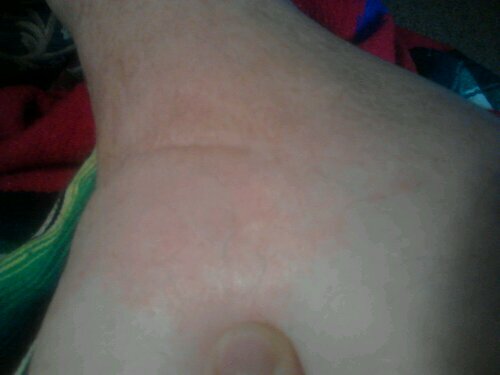 I also developed a new and painful bump where my foot flexes. 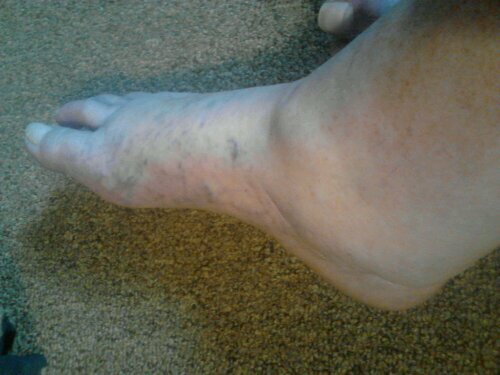 At the V part of the lipodermatosclerosis I have developed a watery bubble that has popped twice and it hurts right to my bone. Rhett says I shouldn’t feel so guilty about missing church. He thinks it’s crazy that I do. Sigh…. Wendy, wondering if your diabetes is up! Did you think to check it since you have the weird breath? I added a supposedly better pic of the bubble. Just from me putting my finger there, my leg went into agony. I sure hope that’s not an ulcer forming!